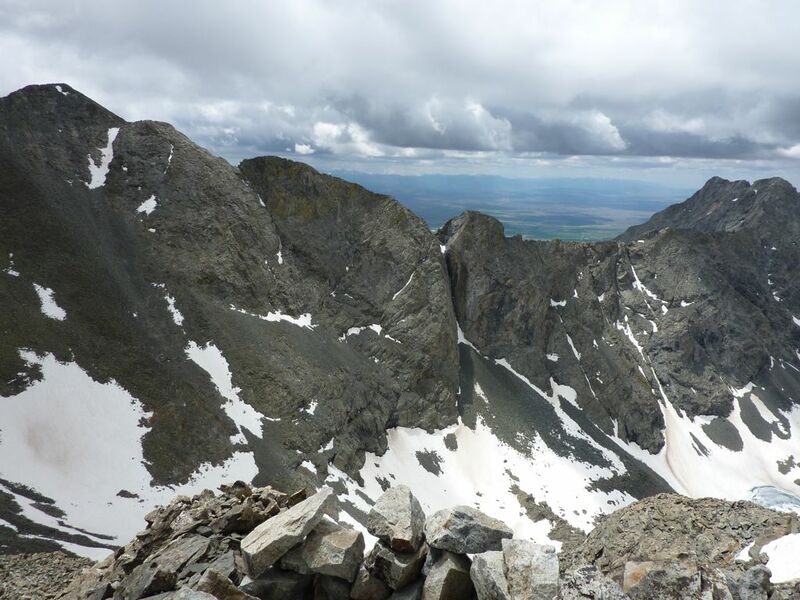 I spent the 13th and 14th climbing the four 14ers in the Blanca region. These are challenging (4th class) and relatively wild peaks, and some of the best climbing I have had so far this season. However, the write-up is a bit rough because of the long(er) days, long drives, and primitive towns in the area. Looking toward Blanca (r) near the trailhead. While Lindsey is overshadowed by its larger neighbor Blanca, it is well worth the trip, for both the scramble and the wilderness. The back (north) side of Blanca is hard to get to, but beautiful and relatively wild. The road to the trailhead is mostly passenger car-friendly, though someone seemed to have recently had an inadvertent oil change. 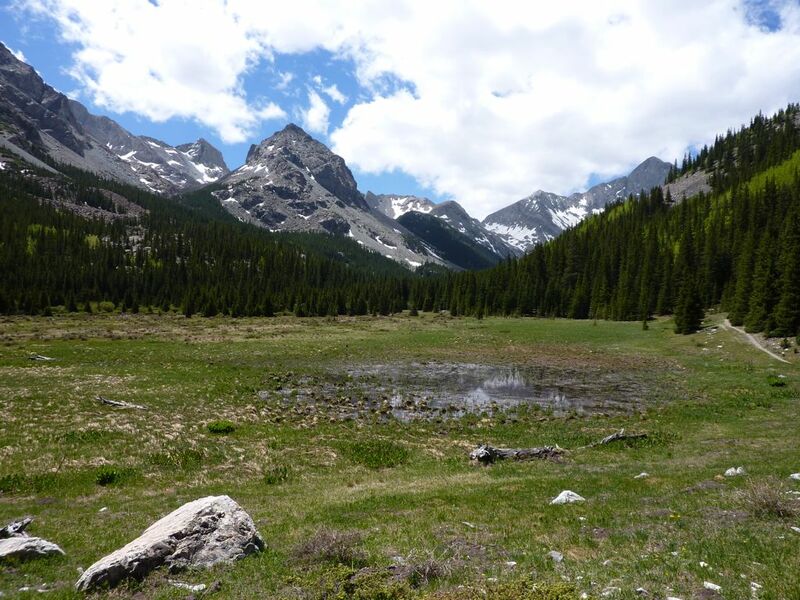 Unlike most 14ers, which have well-worn and -marked trails most of the way to the summit, the route to Lindsey is cross-country between the Lily Lake trail and treeline. I passed a signpost with no sign at a fork in the trail, then a side-stream near a cairn by the trail, and guessed that this was where I should turn. I was heading up and more or less in the right direction, and the woods weren’t too dense. I didn’t know much about the approach, so I was relieved to see a use trail and several tents across the way as I reached treeline. I met one party who had turned around because of snow as I made my way up to the ridge, then met a man starting on the ridge variation. While the standard route was still a snow climb, the ridge was clear, so perhaps the first party was unaware that it was an option. If you cut to the left of the crux, the ridge is no worse than class 3, but I took a more direct, spicier approach on the way up. The short piece of 4th and easy 5th class climbing was a fun change of pace after so many walk-ups. 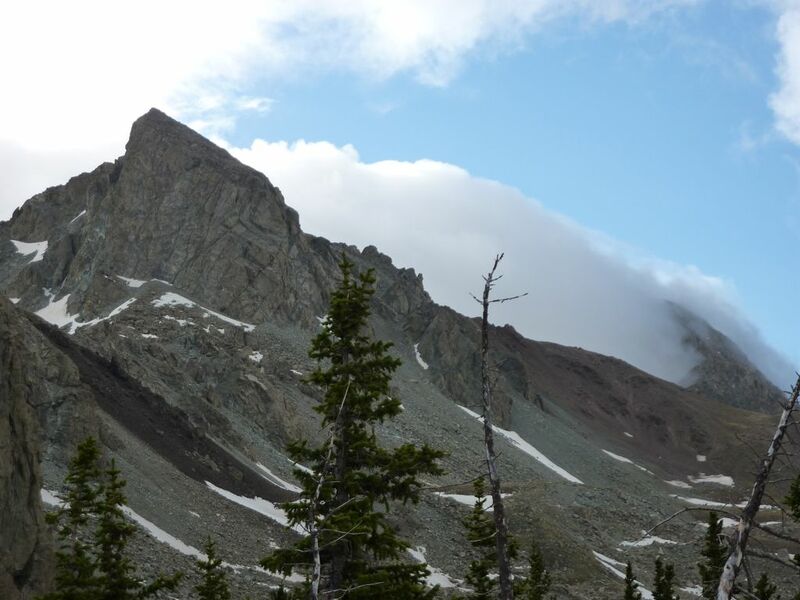 I left the summit quickly because of the clouds, took the easy way around the crux, and cruised back to the trailhead. 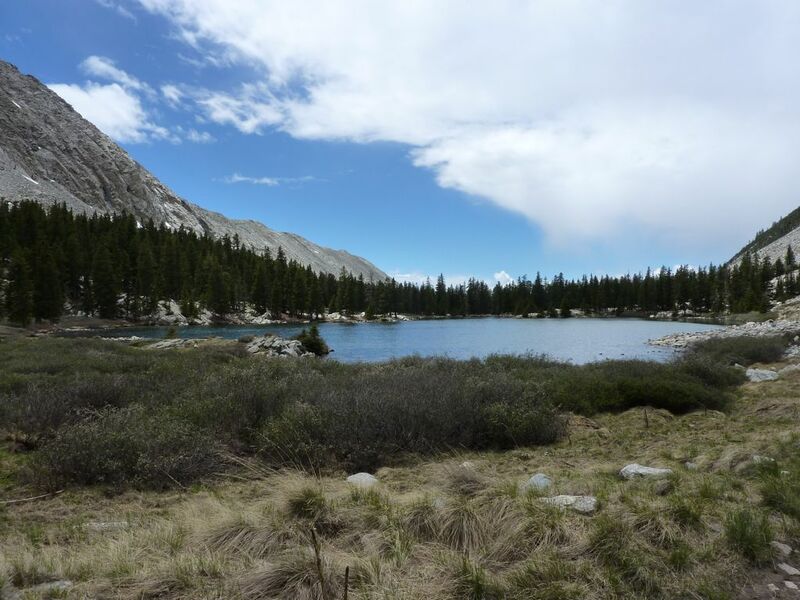 I had originally planned to tag Blanca and Ellingwood via the Gash Ridge, which shares a trailhead with Lindsey, then get at Little Bear from the Southwest. However, I chose to save a day and get all three the standard way. This would allow me to experience two classics: the Little Bear to Blanca traverse, and the Como Lake road. The 'road' to Como Lake. Yes, the road is as bad as rumored; comically, almost deliberately bad. It is justifiably famous among off-road enthusiasts. Even down in the desert, it is a pile of loose river rocks. 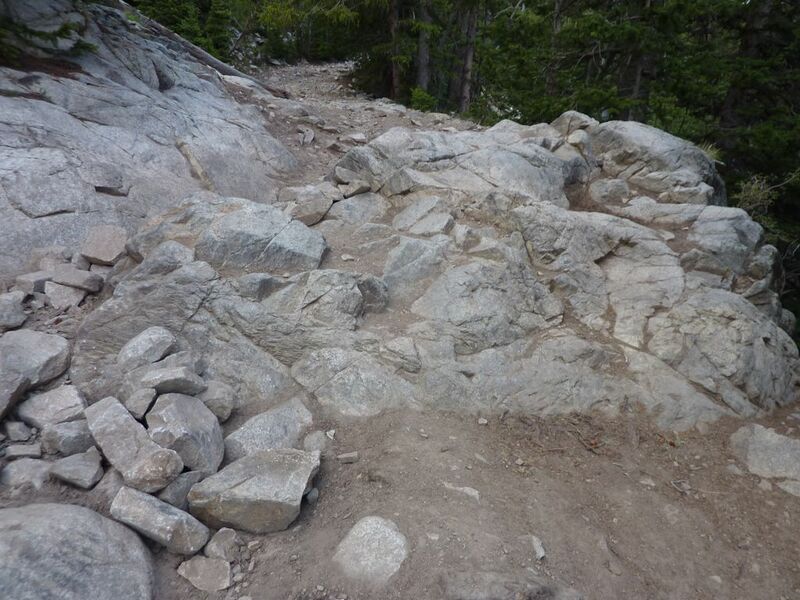 After leaving the river rock section, you enter the foot-high rocky protrusions and six inch loose boulders. If you pass that, you reach a pile of broken alpine rock with a few several-foot-high rock outcroppings, one of which may have claimed a life. 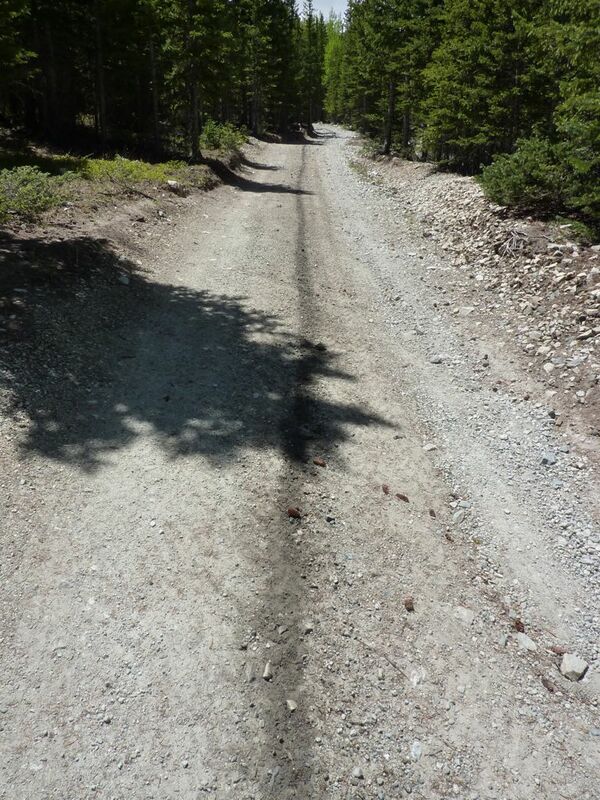 With careful driving and high clearance, I made it to about 9500 feet. There were jeep tracks beyond my campsite, but I managed to park far higher than any of the other hikers. I still had almost 2000 vertical and just under an hour of road-hiking to reach Como Lake in the morning, but I was spared the worst of the desert hiking. I planned to do Little Bear’s northwest face, but beyond knowing which face was the northwest, all I knew about it was that I should go up. I met a man who had climbed over Blanca via the gash ridge the day before — I had seen his party while approaching Lindsey — and he offered a few pointers. Little Bear; NW face starts right of left watermarks. I passed his two companions low on the face, and made for the ridge as best I could. The face is crossed by numerous, convenient rightward ramps, but the easier terrain is on the left. While the rock is not quite as rotten as I had been lead to believe, there was a lot of loose stuff on the route, so I had to climb carefully for the other party’s sake. Partly to avoid knocking down rocks, and partly because of the ramps, I found myself climbing the steeper terrain to the right, which was mostly class 3-4, but definitely featured some easy 5th. 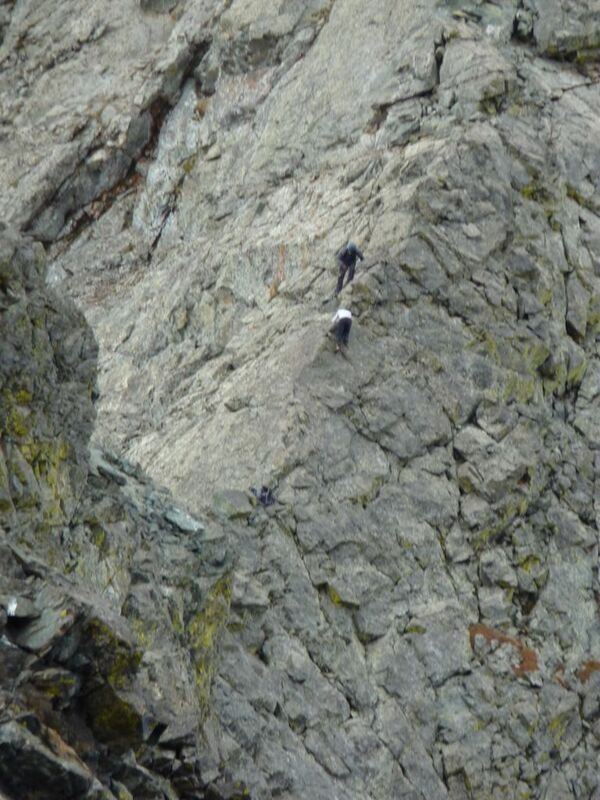 It looked like the looser terrain to the left might be 3rd or easy 4th class, but this is a surprisingly tough route. Starting off Little Bear, the hard part of the traverse. Climbers descending off Little Bear. After loitering on the summit, I was surprised to meet the other party as I started along the ridge. Since they seemed to be fast on technical terrain, I expected to see them close behind on the ridge, but never saw them after the first few minutes. The initial descent off Little Bear had a few tricky parts, but the ridge was mostly straightforward, if wildly exposed. Many parts were almost like a sidewalk with cliffs on either side. I dodged a couple of the larger gendarmes to the left or right, but mostly stayed on the crest; unlike many ridges, this one actually rewards staying on top rather than to one side. While I have done more technical and more exposed traverses, this one is probably the most fun. If you don’t fear exposure, I heartily recommend this route. 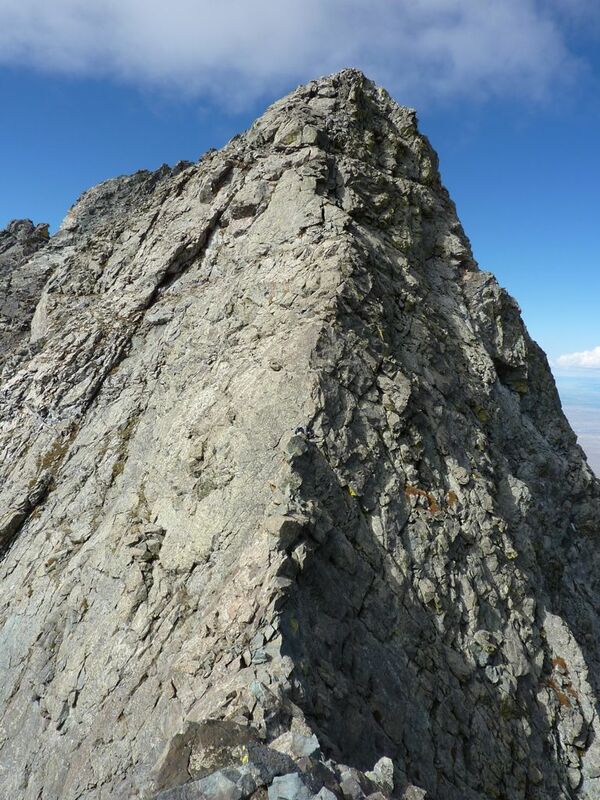 I met two other climbers on the summit of Blanca, and together we began the traverse to Ellingwood. This was mostly class 2 down to the saddle, with a little class 3 on the other side. I left the others behind here, but waited at the top, in part because I saw the first party finishing up the ridge, and wanted to see if they had found my sunglasses. 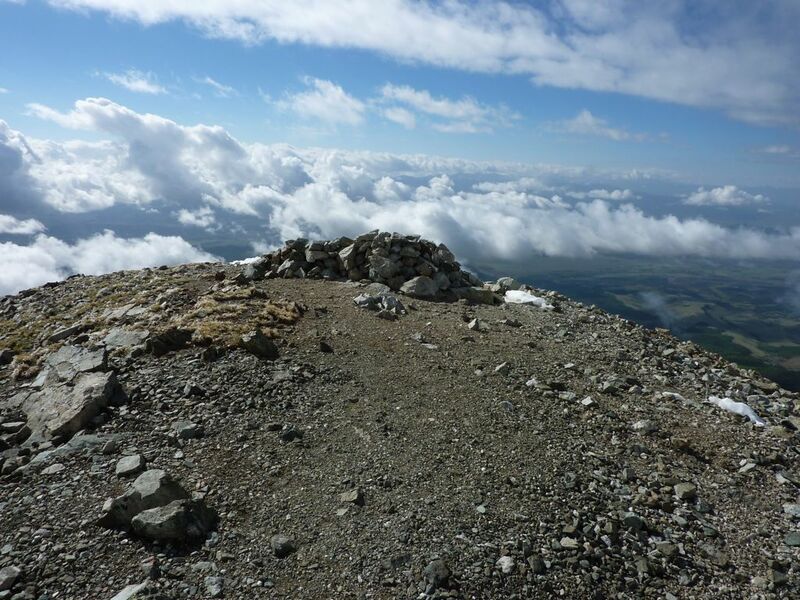 I left as soon as my companions reached the summit, because it had turned cold and begun to snow. I made my way carefully down the slippery rocks, then enjoyed a short glissade to a sort of moraine, where I waited for the first party to slowly make their way down Blanca. They unfortunately had not found my shades, so we talked a bit and I left them behind near the large ice lake above Como Lake. From there it was a long but straightforward walk to the car, and a tricky drive to the highway. 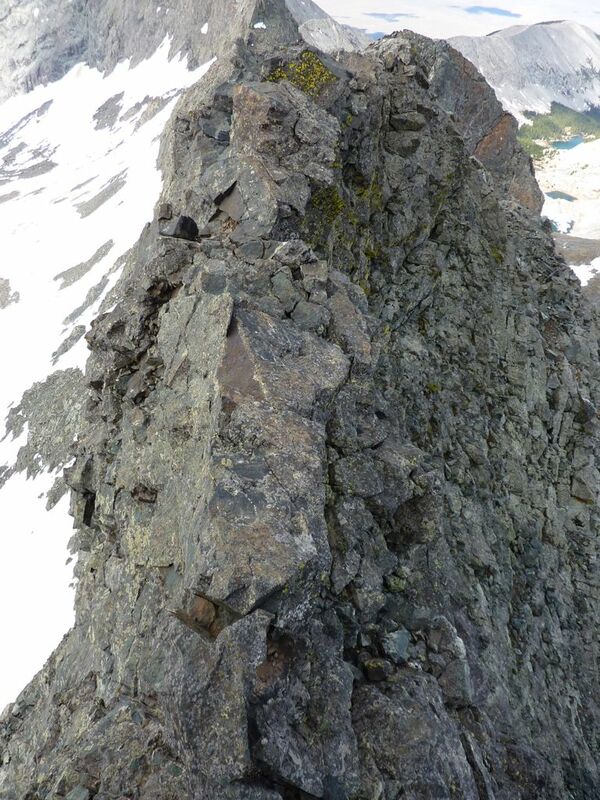 Update: One of the two climbers I met on Blanca, Kevin Hayne, fell to his death on Little Bear the next day. The “road” to Como Lake. 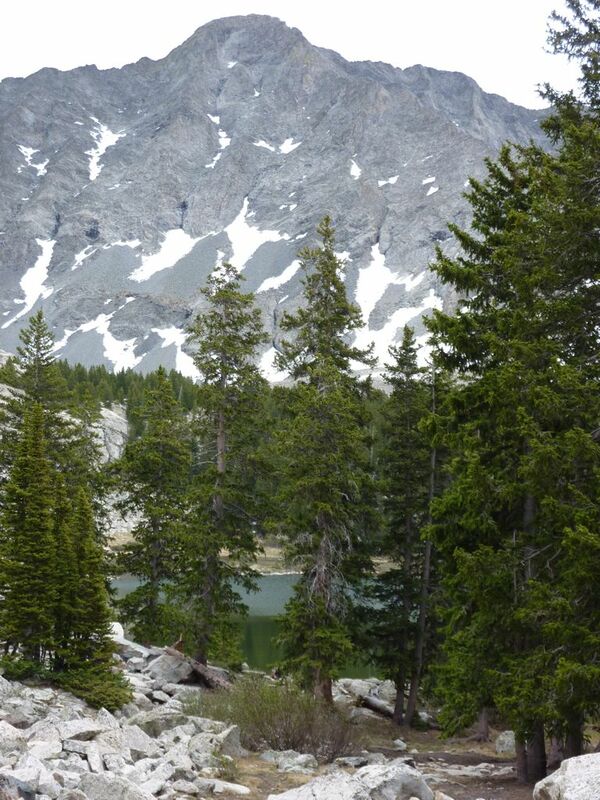 Ellingwood (l), Blanca (r), and the ridge from Little Bear. Blanca’s (l) and Ellingwood’s (r) cliffy north side.